I missed the large dip in PM today. It largely is now flat. MO dropped a lot and I bought it after a 10% drop. It was lower intraday but I did not wake up early enough. The announcement that the FDA will look at reducing nicotine concentrations in cigarettes caused all tobacco vendors to drop today. I took the opportunity to add. I added $1663 in MO today. Will add more if the yield hits 4% territory. Any drop in PM below 5% I will start adding. PM is largely international so I don't think there's much effect on PM. I purchased around $1000 in 3M (MMM) after they announced earnings. The stock fell 5% so I decided to add more to my position. My investing started back in October 2013. I have been diligently investing my income into dividend paying stocks so that one day I can live off the dividends. The companies I invest in are largely dividend aristocrats with large margins of payout safety and track record of dividend increases over many decades. My primary focus is dividend safety and the growth of that dividend on its own. Back then I had $0 in passive income every year. The contributions initially felt like a complete waste of time. I had people tell me 3% yield (what I'm shooting for as my average portfolio yield) is nothing and that it would take forever to accumulate enough assets to live off of that. The income I was receiving from my dividends in 2014 every month would barely pay for a happy meal. But now the dividends are rolling in. I'm making more from my dividends now doing absolutely nothing than when I was a college student laboring away at minimum wage part time to pay my rent. The dividend payments are quite sizable now with my largest month January paying over $1000. I'm certainly glad that I kept with my original plan instead of spending the money as the dividend payment effects are starting to snowball. I estimate that by the end of August or September I will be able to cross the $10,000 a year mark in dividends. This means that every year I will be able to receive $10,000 for doing absolutely nothing. I can be sipping martinis and those dividend checks will still be mailed to my door. What a great feeling to not have to be tied to an employer. Eventually I hope this number grows even more so I can sustain my entire lifestyle with passive income. 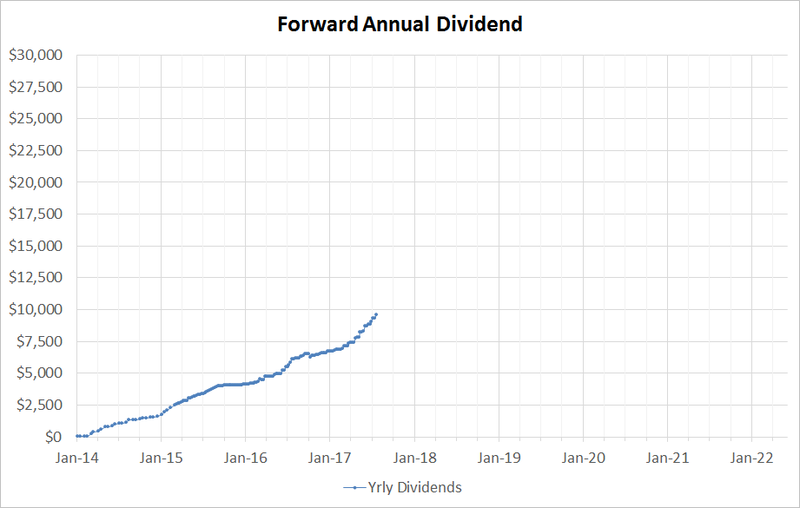 I expect that with dividends reinvested, this $10,000 will be able to grow by 10% (3% yield reinvested with 7% dividend growth on its own), which means that $10,000 in one year will become $11,000 the next year and $12,100 the next. I find that this is a great way to snowball my passive income without having to work at all. I invested heavily in the Q2 of 2017. A lot of my position was in cash starting in 2017 so I deployed a lot of that to work. I will post when I finally cross the 5 figure mark in a few weeks. Shares of HD dropped 4.1% today after Sears said it is now selling its Kenmore appliances on Amazon. I took this opportunity to add $2000 to my existing position in HD. I prefer to buy winners but I also added to companies that are having a tougher time now. Companies that are doing fantastic include PEP, V, JNJ. KMB is experiencing P/E contraction but overall is relatively flat. Hormel is still growing well but is experiencing P/E contraction. AT&T is getting competition from T-Mobile and has seen share price falling, but overall it's still very much flat in terms of growth. GIS and SJM are having a tough time in the super market, especially GIS due to their product portfolio positioning and the transition to Organic and natural. GIS has no growth at this moment. TJX is expanding (same with ROST). However TJX traded at a high P/E and experienced P/E contraction due to the Amazon pressure on retail. The report will be summarized using data up to July 7, 2017. Not much excitement in June. 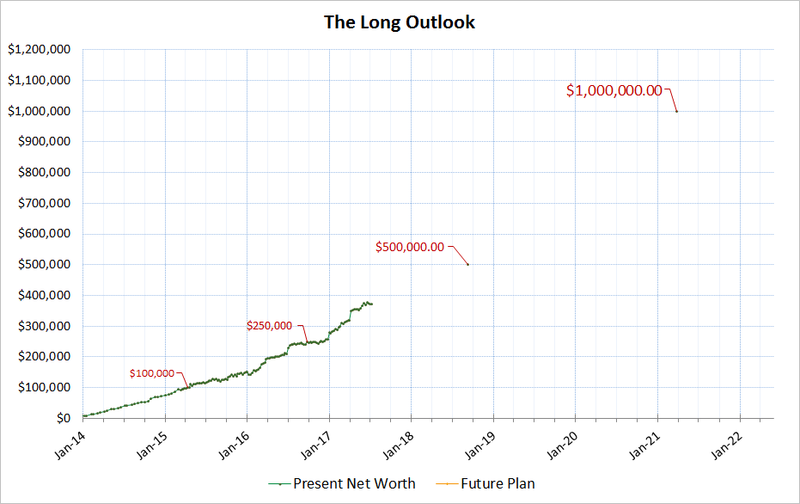 The portfolio stayed relatively flat however my forecasted annual income from my investments climbed higher since I added to several positions. I recently added a new position in Federal Realty (FRT). It's a dividend aristocrat REIT company. Together with Realty Income (O), these two companies will provide me decent dividends in the real estate category. The purpose of this portfolio is income replacement. I have a desire to one day live off these dividends. The dividends must be completely safe even during economic recessions. The companies I invest in must have products that have strong demand and are not at the whims of "fads" that come in and out. 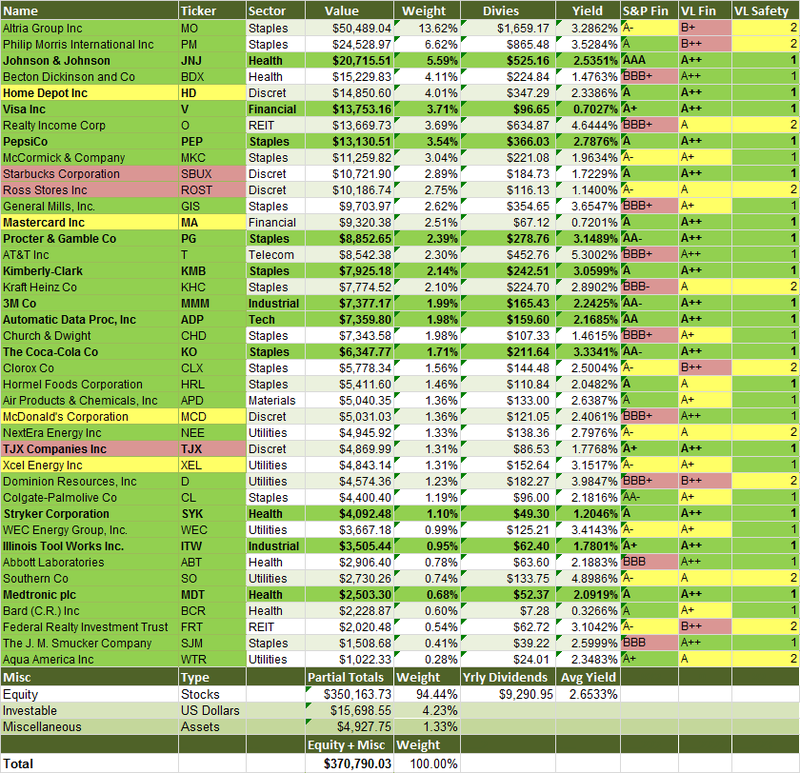 The portfolio chart below highlights companies that I consider Core positions as Green. Yellow positions are Supporting positions and Red are Speculative. My dividend investing philosophy holds strong with the Core names but the Speculative names are purely for capital gain alpha. Positions can only be labeled as Core by me if the companies have demonstrated that they can withstand the test of time, they offer products or services that the economy uses no matter what, and have a proven track record of dividend safety and dividend increases. At this time, my portfolio is spitting out $9290 in dividend per year. The highest dividend paying month is January which is $1026. 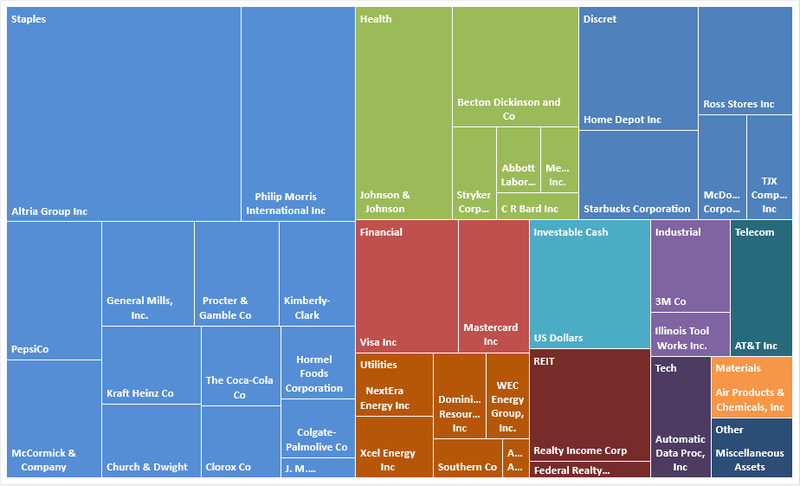 My portfolio is heavily weighted into Consumer Staples companies. These types of companies offer products we use every day such as water and beverages, shampoo, toothpaste, toilet paper, electric utilties, food, cleaning products, or nonprescription medicine. Consumer Staples tend to have less alpha than more volatile industries like Energy, Technology, and Discretionary. However, my goal is income predictability and safety and Consumer Staples offer the best return for the associated risk to me. Many of the companies I invest in are dividend aristocrats with over 25 continuous years of dividend increases. My goal in the future is to increase my holdings in the Healthcare and Utilities space. Right now I am a bit too heavy in the Consumer Staples, however I like each of the companies I am holding now in the Consumer Staples sector. For Healthcare, I am looking to add more to JNJ and BDX. And for Utilities I am waiting to add more to NEE. If Industrials ever pull back, I will be looking to add to names like MMM, ITW, and a military defense name like GD. However, industrials are way too hot right now. I do hope to increase my weight in Industrials eventually since my weighting is way too light at this time. Industrial companies will always pull back as their betas are rather high. When the economy slows down that will be my chance to add into high quality companies at an low price. Industrials tend to overshoot downwards when the economy slows down. In terms of Financials, I do not like investing in banks. They are too risky for my taste and I do not know how to read their financial statements. It's far too complicated and I do not know who they are lending money to. I tend to prefer financial middlemen companies. These include payment transaction companiesl ike Visa and MasterCard. They offer "tollroad" type operation and have no lending risk. I believe the future will be cashless especially for the rest of the world. Many of the developed nations in the world still use cash and Visa + MasterCard is the future, hence my extremely long stance on V and MA. Technology companies have enjoyed a very strong run. I have unfortunately been left out. I never chase price gain as I am always about the income from dividends. If the technology companies ever pull back I will open my eyes to high quality dividend paying technology companies like MSFT, ACN and ORCL. Although I view Amazon, Facebook, and Google as leaders in their respective industries I just cannot get myself to invest in anything that pays no dividend so I will watch those giants on the sidelines. My annual dividend is almost hitting $10,000. I think by the time summer ends I will be able to cross the $10k a year mark in passive dividend income :) Took me a long time to get here, and it's great to see my money generating more money. The reason my dividend has been rising faster than expected is because I accumulated a large cash position around January 2017 through May 2017. I eventually deployed all the cash to earn more dividends since I eventually decided I will not be using the cash for anything else within a 3 year period. If the cash is not needed, I will invest it automatically even if the market is high low or flat. I always keep around $7000-10000 in emergency cash just in case something bad happens. The graph below shows my current progress to $1MM. Not much happened in the last month. Many of the companies I hold became cheaper in June which helps boost the dividends I can acquire for each purchase I perform. I don't forecast any surprise cash increase into my portfolio, my income will be quite the ordinary for the rest of the year. I may have a slight bump down in a few weeks when I move into a new rental apartment (curse the living costs in the bay area). FRT: $2020 - this was purchased in my 401k since FRT is a REIT with unqualified dividends. FRT is a new position for me and will be my second REIT after my holding in "O". FRT is one of the highest quality real estate companies that targets upper income densely populated areas. I am loving how FRT is pulling back nicely on the Amazon retail scares and rising interest rate environment. The company is a dividend aristocrat and the highest credit rating in the industry (even higher than "O"). I plan to optimize my 401k to hold only tax unfriendly investments like REITs. So when my cash position in my 401k accumulates up over $2k I usually deploy it to a REIT, and now I have O and FRT as options. The market is pulling back on many of my holdings. This starts to make a lot of my holdings more attractive for purchase. I have around $15,000 in cash left but I usually keep a steady amount for emergencies. My cash position has shrunk from over $30,000 in the past months to $15,000 which has helped increase my dividends per year. At the end of the month I always check the totals of all the dividends I received. It is a good way for me to check my progress so that I can compare my current progress with last quarter's or last year's results. For this month I received $773 in dividends. All funds were invested back into the companies that paid them. $773 is not enough to live off of completely but it is also not a small amount. At this point, I have no problem supporting myself on the dividend alone aside from the bay area's absurd rental prices. I recently added the following positions to my portfolio on Friday after the pullback that happened that week.